IT Administrators and other stakeholders of Small and Medium Businesses might not have a proper backup plan for their data centers and can end up investing a lot on inefficient backup solutions. Moreover, adopting a backup solution needs testing of all the features of a backup solution. Vembu BDR Suite v3.8.0 FREE edition is designed understanding these setbacks and makes this one of the most business-friendly backup solutions. 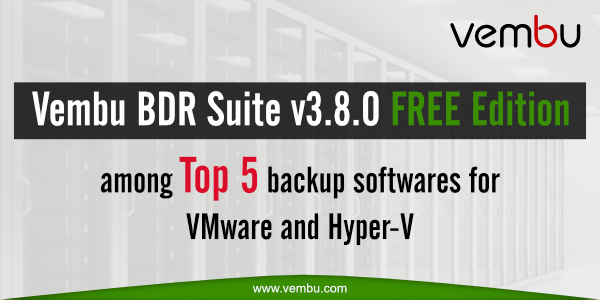 In Mohammed Raffic’s recent article on Top 5 Best Backup software for VMware and Hyper-V infrastructure, Vembu BDR Suite v.3.8.0 FREE edition has been included for all the right reasons. Most backup softwares restrict features with their FREE edition version. But Vembu stands out among most backup software vendors by offering unlimited features to VMs using FREE edition of Vembu BDR Suite v3.8.0. Let’s get to know what’s so special about this FREE edition. This latest version offers no feature restriction and is beneficial for those businesses who wish to have a backup strategy in place. The FREE EDITION comes with two major categories. One, unlimited features for three virtual machines and the second thing being able to backup unlimited virtual machines with restricted features. The article throws light on the versatility of the features that makes Vembu an important name in the market of the backup software vendors for SMBs. Be it the simple UI setup, it’s dynamism to provide VMware Backup, Hyper-V Backup in addition to its support for Physical Servers and Workstations or the flexibility in deployment like on-premise, off-site, cloud and hybrid cloud. Vembu stands tall and unique and hence becomes the most sought after FREE edition with this latest Vembu BDR Suite v3.8.0. Let’s further delve into matters that forms the crux of Mr.Raffic’s article. The IT Administrators can still continue with the trial version without any feature restriction. Thus this free edition is free forever! Backup and recovery holds good for both physical and virtual environments and makes granular recovery possible with great ease. You will able to scale out your storage, secure your individual backup jobs with in-built deduplication, encryption, and compression that makes its own file system called, the VembuHIVE. And what not, it thus becomes suitable both for testing and production environments. In addition to it, you will also be able to configure agentless backup and restore for Disk Image Backups without physically installing any agent on your physical machines.